Aviation Updates Philippines - As Cebu Pacific prepares for its expansion globally, the airline introduced the "all-new Cebu Pacific" that has a newly designed logo and a proposed livery. The airline is trying to be the Philippines' global airline of choice. 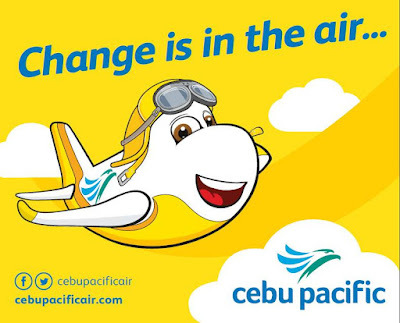 Cebu Pacific Air's new logo. The eagle icon remains with new colors and is friendlier and more approachable. Cebu Pacific's new logo features the colors of the Philippine islands, the sky and the blue seas used in painting the eagle icon. The airline also used the same font as Cebgo's logo. "Because we are a Philippine carrier, we need to be able to have a brand that represents the colors of the country and when you talk about the Philippines, you think of beautiful beaches. You think of blue seas and bright sun. You talk about beautiful landscapes and islands," Iyog said. "We wanted to make sure that the brand captures that while it also represents the airline as a young, fun, dynamic, and energetic brand," she added. Cebu Pacific's new livery as shown on its YouTube video. The airline, which was once a domestic airline when it was launched in the 1990s, already flies to 32 domestic and 25 international destinations in over 14 countries worldwide. It operates 55 aircraft comprising of 10 Airbus A319, 31 Airbus A320, 6 Airbus A330, and 8 ATR 72-500. "When Cebu Pacific started out nineteen years ago, we were just serving a domestic market. But today, we are talking about flying [to] international markets so there is a need to refresh the brand. The new brand is an evolution of the current brand. We still carry the eagle but it's friendlier and more approachable," Cebu Pacific Vice President for Marketing and Distribution, Candice Iyog said in a video of Cebu Pacific Air. According to Captain Manny Osias, Cebu Pacific continues to bring the international community closer to the Philippines. He also said that the airline is now capable of flying to long-haul international destinations such as Dubai, Riyadh, Kuwait, and Sydney. Cebu Pacific is scheduled to launch its Manila to Doha service on June 4, 2015. Cebu Pacific aims to be the Filipino's airline of choice and to be more accessible to people. "We are now truly an international carrier, making the Philippines much more accessible to people throughout the globe and we're very proud to be a representative of the Philippines," Cebu Pacific Chief Executive Officer, Lance Gokongwei said. "The Philippines represents our roots. It's where we come from and it's really such a jewel. It's part of Cebu Pacific's mission to make that jewel that much more available and accessible to the world," Gokongwei added. "We hope that Cebu Pacific becomes the Filipino global brand for travel, for fun, for affordability. We just want to be synonymous with the Philippines," he said.